Russell Greene (pictured during the 2007 CrossFit Games) is a CrossFitter who stumbled upon What is Fitness in 2002 when he was 16. He became addicted and did what he could from the workouts posted and the small, grainy videos available then. This is the third of a series (The Best of CrossFit.com) in which dedicated and/or long term CrossFitters highlight their favorite or most influential archives from the vault. Russell gets philosophical about the nature of CrossFit, and the changes it has had on his life and mind. This is a well-rounded article as he has been inspired by the athletes, coaches, theories, ethics, politics, and ultimately, the empirical results found in CrossFit. An early adopter of CrossFit, Russell Greene shares lessons from his first decade of training. Check out that Harbor City Crossfit t-shirt right at the top of page 1! Russ, great article. You are a true exemplar of the CrossFit organization. It's good to see other college students staying so disciplined with CrossFit. I am attempting to get a CrossFit club off the ground at my school, UNC-Chapel Hill. You may have seen the article that speaks to these efforts in the Journal. Anyways, if you or one of your friends would like to do something similar at Georgetown, I would be happy to help in any capacity that I can. My email is david45@email.unc.edu. Short story: Awesome article. Very informative and fun to read. However, I think you shortchange the benefits of a college education, and I don't want to see a positive example such as yourself push someone on the hairy edge of that decision over the line that keeps them out of college. As I'm sure you have found, college is what you make of it. Sure, you can buy your textbooks from Amazon, but if you start out knowing nothing about a topic then how can you structure a curriculum for yourself with challenging coursework at an appropriate level? Sure, a genius could. Most of us are not geniuses. You have also experienced a lot of social interaction and leadership that your non-college educated peers probably have not. If you wish to look at all things empirically, then study data about the results of a college education. Education is the #1 independent variable associated with obesity. Higher education, less obesity. Education's effect on job opportunities and financial success is obvious. Not all institutions are solid, but not all institutions are weak. Be skeptical of institutions, but to dismiss them simply because they are institutions is to miss your own point: evaluate by results. Great article, Russ. For the many years I have been involved with CrossFit, I have always appreciated your posts and insights, as well as your athleticism. Your intelligence and rationale belies your age and experience. Keep up the great work and best of luck in the future, CrossFit and otherwise! A good article, but I have to agree with Jeff on the point of a university education. Do not tar all Higher Education Institutions, or even degree programmes with the same brush. To be honest I find the suggestion that one could obtain the same level of education by purchasing textbooks from the internet rather than attending university to gain a degree incredibly misinformed and borderline insulting. There is no way on this earth that I could pursue a career in research physics (and most probably in any other scientific field) without first attending university. I think you are confusing correlation and causation in the relationship between a university education and obesity rates. Having seen the lifestyle that most college students live (no sleep, too much alcohol, pizza for breakfast) I find it unlikely that a college education itself makes people less likely to get fat. I suspect that it is instead correlated to other independent variables such as income level and intelligence that make obesity a less probable outcome. I was not disputing the utility of a college education, but rather the perceived necessity of it, in most fields. I am certainly open to the argument that in certain subjects such as physics, it is difficult to reach a high level of understanding and skill without "first attending university." My point was merely that for some people, depending on the subject and their learning style, college may not be necessary. Therefore, we should evaluate individuals by the outcome of our educational method, not the method itself. Performance, not paper credentials. For example, a friend of mine, Jacob Tsypkin, dropped out of college. 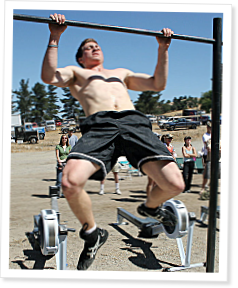 But he owns Crossfit Monterey, competes in national poetry competitions, and speaks fluent Russian, at 19 years old. Another good example, is the creator of Crossfit, Greg Glassman. Russ, I very well may be wrong on the obesity vs education point, but it's just a diversion from my main point: it's generally a bad idea to ever advise anyone against obtaining a college education. Yes, plenty of examples exist proving that you can succeed despite a college education. However, surely you would agree that these examples are not representative of society as a whole. In my field, engineering and government contracting, level of formal education directly determines how much you can charge the government for your services. That's just one example, but in my opinion the average return on investment of a college degree is far better than the average return on investment of an entrepreneur, who is statistically very likely to fail. Once again, I commend your achievement and positive example. But I don't want a single 19 year old kid to read your article and think, "He's right! I don't need to go to college. I'll be the next Steve Jobs or Bill Gates." My contention is that for every person who makes that resolution 1 of 100 will become a successful entrepreneur and the other 99 will get stuck in the lower middle class for the rest of their lives. I love the free market. I am all about risk and reward. But what you're advising is for the mentally wealthy ONLY, and is a gargantuan risk to everyone else. Anyone who is gifted enough to follow your advice and succeed was probably on that track before you advised them. However, scores of others will use it to justify the "easy" way out. Great article Russ. Working on my mental toughness, but diet discipline is a killer!